Welcome to Nanomaterials and Manufacturing Lab (NML)! Our research is focused on nanomaterials innovations and scalable novel micro/nanomanufacturing processes for revolutionary applications in environment, healthcare, things network, etc. 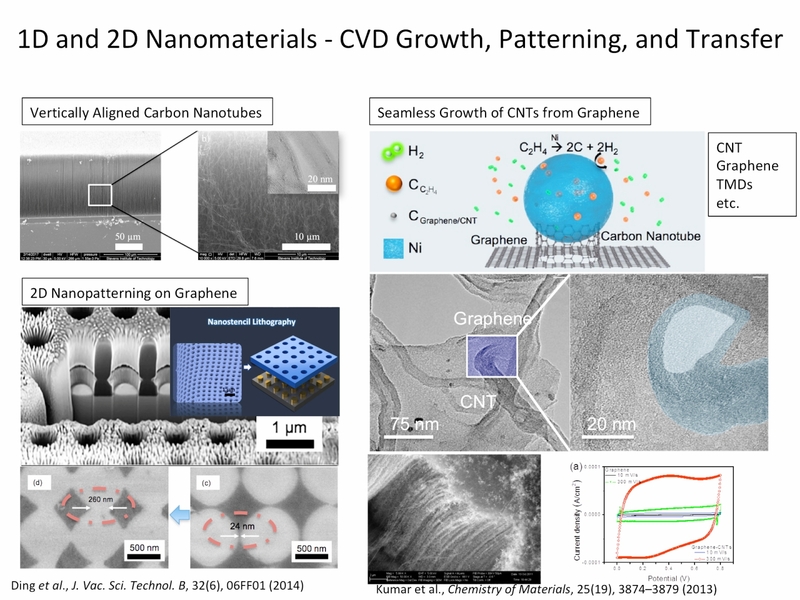 We are exploring synthesis, patterning, and transfer of one-dimensional, two-dimensional nanomaterials. 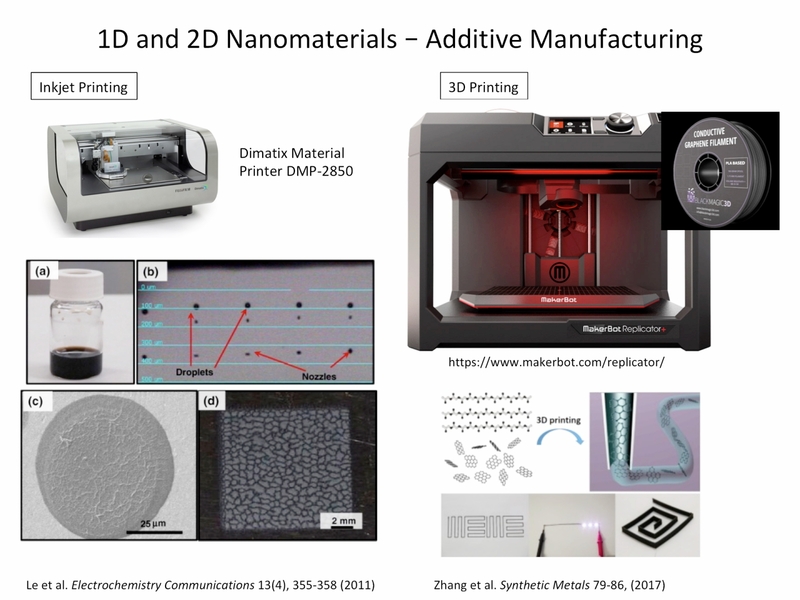 We are also developing novel manufacturing methods for nanomaterials and nanocomposites including scalable nanomanufacturing and additive manufacturing (also known as 3D printing). 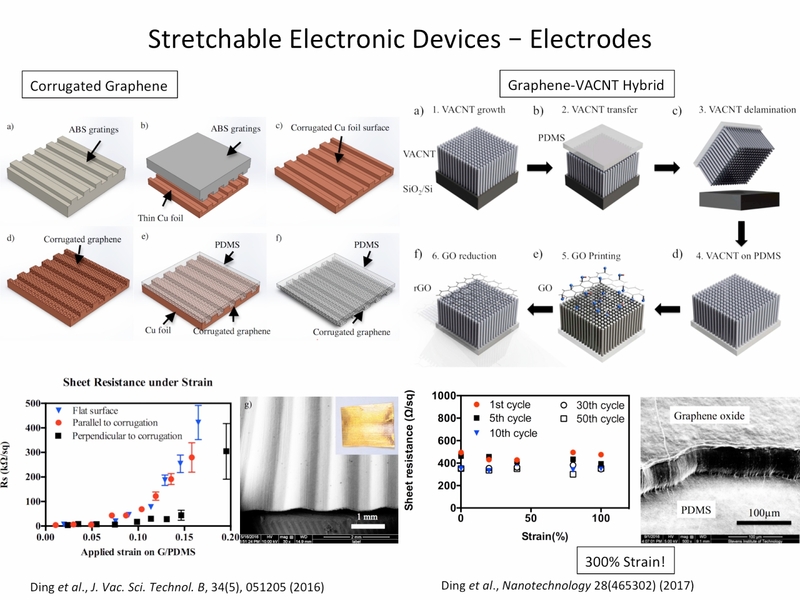 With the unique properties of nanocomposites, applications in flexible and stretchable electronic systems such as electrodes, power sources, and sensors with particular emphasis on components are of great interest. The research interest focuses on the synthesis and processing of nanomaterials, scalable micro/nanomanufacturing processes, and additive manufacturing. 03-22-2019, our collaborative work with Domantas Peckus, Adrien Chauvin, Tomas Tamulevičius, Mindaugas Juodėnas, Chang-Hwan Choi, Abdel-Aziz El Mel, Pierre-Yves Tessier and Sigitas Tamulevičius, entitled “Polarization-dependent ultrafast plasmon relaxation dynamics in nanoporous gold thin films and nanowires“, is published in Journal of Physics D: Applied Physics. 02-08-2019, Chao Liu passes his PhD qualifying exam. Congratulations! 11-25-2018, Chao Liu and Dr. Ding present our work “Direct Ink Writing of Multi-Walled CNT Reinforced Alumina Matrix Composites for Conductive Ceramics” at 2018 MRS Fall Meeting in Boston, MA. 11-11-2018, Dr. Ding presents our work “Direct Ink Writing of Graphene Oxide Reinforced PDMS Matrix Composites for Improved Mechanical Properties” at 2018 ASME IMECE in Pittsburgh, PA.
09-18-2018, our work on superhydrophobic nanostructures based optical waveguide with Prof. Ke Du, Dr. Ishan Wathuthanthri, and Prof. Chang-Hwan Choi, entitled “Superhydrophobic waveguide: liquid-core air cladding waveguide platform for optofluidics“, is published in Applied Physics Letters. 08-15-2018, Yuqi Gao joins NML as a PhD student. Welcome! 05-15-2018, MSE undergraduates Ashley Lenau, Benjamin Zimmerli, and Eric Bennett join the NML to conduct summer research projects on 3D printing and carbon nanomaterials. Welcome! 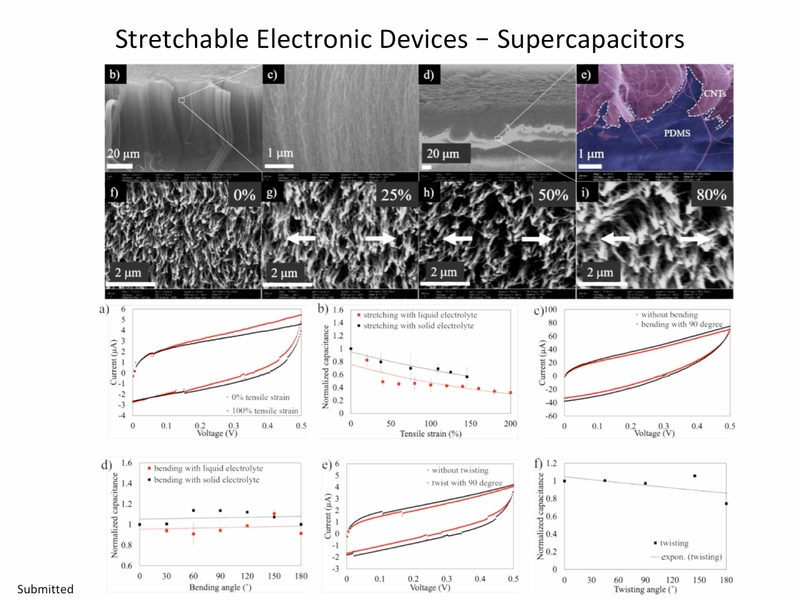 04-16-2018, our work on stretchable supercapacitors with Runzhi Zhang, Chao Liu, Prof. Eui-Hyeok Yang, entitled “Highly Stretchable Supercapacitors Enabled by Interwoven CNTsPartially Embedded in PDMS“, is published in ACS Applied Energy Materials. 02-15-2018, Dr. Ding delivers an invited talk in Rochester Institute of Technology on “Carbon Nanomaterials for Flexible Electronics”. 02-13-2018, positions are open for undergrad research. Please find the details through the link to Openings. 01-14-2018, Chao Liu joins NML as the first PhD student. Welcome! 11-26-2017, our collaborated work with Dr. Ke Du, Youhua Jiang, Dr. Po-Shun Huang, Dr. Tongchuan Gao, and Prof. Chang-Hwan Choi, entitled “Self-Formation of Polymer Nanostructures in Plasma Etching: Mechanisms and Applications“, is published in Journal of Micromechanics and Microengineering. 10-23-2017, our collaborated work with Dr. Ke Du, Dr. Ishan Wathuthanthri, and Prof. Chang-Hwan Choi, entitled ” Selective hierarchical patterning of silicon nanostructures via soft nanostencil lithography“, is published in Nanotechnology. 10-23-2017, my research paper with Shichen Fu, Runzhi Zhang, Dr. Eric Boon, Prof. 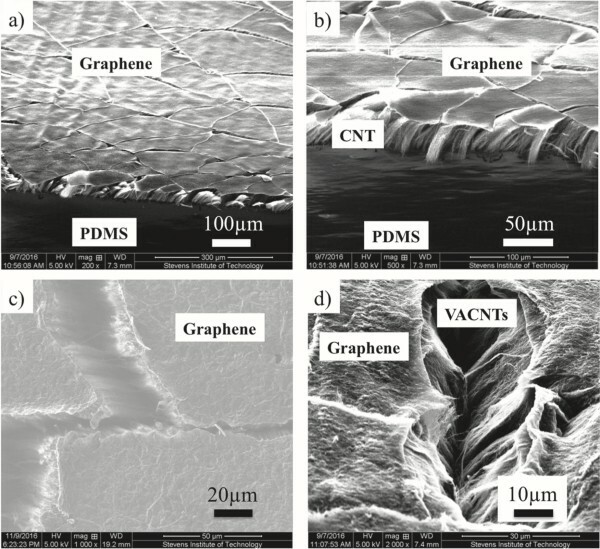 Woo Lee, Prof. Frank T. Fisher, Prof. Eui-Hyeok Yang, entitled “Graphene-vertically aligned carbon nanotube hybrid on PDMS as stretchable electrodes“, is published in Nanotechnology. 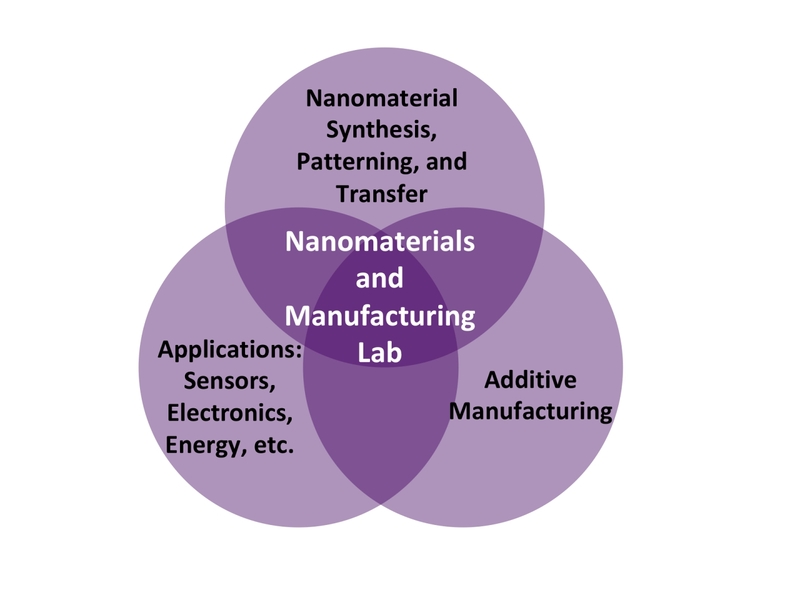 08-15-2017, Nanomaterials and Manufacturing Lab (NML) starts in Materials Science and Engineering, Inamori School of Engineering, New York State College of Ceramics, Alfred University. 08-15-2017, I joined the Inamori School of Engineering, New York State College of Ceramics at Alfred University as an assistant professor of Materials Science and Engineering. Follow us on instagram for the most updated news!